Get spooked at the Haunting of Hannon Library III: Little Dead Riding Hood. A library on a bustling campus isn’t usually the stuff nightmares are made of, but thanks to LMU’s Theater Arts students, for a few days in October, the library is transformed in to a scene right out of an Edgar Allan Poe story. Theater arts students “haunt” the stacks at the library, while acting out scenes from famous horror novels, while guests are lead through the library’s “paranormal literary activity” by tour guides. The event will take place Friday, October 23 from 8 to 10:30 p.m. for LMU students and is open to the public on Saturday, October 24 from 2 to 3:30 p.m. Saturday’s event is family-friendly for guests 10 and up. Treats will be served and costumes are encouraged. Parking is free on the weekends at LMU, located at 1 LMU Drive in Westchester. Celebrate a Haunted Harvest at Westchester Secondary Charter School. Get an early start on your Halloween day festivities at WSCS’s third annual Haunted Harvest festival on Saturday, October 31 from 10 a.m. to 2 p.m. WSCS students and parents will be hosting carnival games and haunted classroom tours. Food will also be available for purchase. WSCS is located at 8540 La Tijera Blvd. in Westchester. Take a trip to the pumpkin patch. 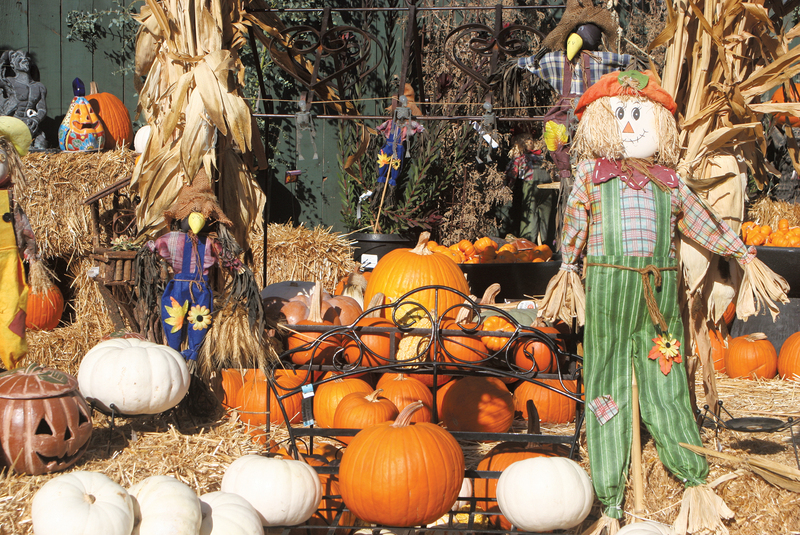 The Marina del Rey Garden Center is the perfect stop for your pumpkin-picking needs whether you’re looking for a gourd to carve or to use to make your pumpkin pie. As an added bonus, the pumpkin patch makes the perfect backdrop for your fall family photo-ops, thanks to the hundreds of pumpkins in a variety of colors from orange, striped, white and green, scarecrows and ghoulish Halloween decorations. This year, they’ve even created a fun straw maze perfect for kids to navigate through. The Marina del Rey Garden Center is located at 13198 Mindanao Way in Marina del Rey and is open daily from 8 to 5:30 p.m.
Head on down to LMU for the Family Fall Festival. The LMU Children Center’s will hold its annual Fall Festival on Friday, October 16 from 3:30 to 8:30 p.m. Tickets are $25 presale and $30 at the door. Admission includes dinner, drinks and dessert. Children under 12 receive free admission with an accompanied paid adult and will receive five complimentary game/ride tickets. Activities at the event include a bounce house, petting zoo, games, live entertainment, rides and more. The LMU Children’s Center is located at 1 LMU Drive in Westchester. For more information, or to purchase tickets, please call (310) 258-8900. Have a day of family fun at the 2015 Boo Fest. Stop by Playa Vista Elementary School for its Fourth Annual Boo Fest on Saturday, October 17 from 11 a.m. to 3 p.m. Attendees can enjoy food, games, class booths, prizes, a haunted house, pumpkin auction, a bake sale and more. Chili lovers can also rejoice because this Halloween themed event features a chili cook-off! Playa Vista Elementary School is located at 13150 W. Bluff Creek Dr. in Playa Vista. For more info, visit playavistaschool.com. Break out the lederhosen for Oktoberfest. Westchester’s Chalet Edelweiss is making it easy for locals to celebrate Oktoberfest thanks to a menu with German/Austrian inspired items and their German beers on tap. On October 14, the restaurant will host an all-you-can-eat Oktoberfest buffet, where diners can gorge themselves on items like giant Bavarian pretzels, a variety of sausages and homemade apple strudel. Dinner starts at 6 p.m. and is $28/per person (tip and tax not included). Reservations are recommended and can be made by calling (310) 645-8740. If you’d rather learn to cook your own Oktoberfest fare, consider signing up for Fresh Food in a Flash’s cooking class on Thursday, October 8. Students will learn how to make German favorites like beer cheese soup, pretzels, wiener schnitzel, warm red cabbage salad and apple strudel. Classes are $50 when reserved in advance by emailing patricia@freshfoodinaflash.com. Classes are held at Holy Nativity, located at 6700 W. 83rd Street in Westchester. Is your organization holding a fall or Halloween-themed event? Email us at westchesterhometown@yahoo.com to be added to our event calendar!